What’s your first task in getting ready for a wedding? 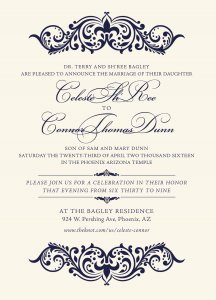 Informing your guests with Elegant Wedding Invitations! 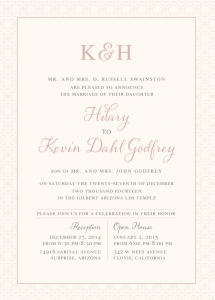 Are you looking for elegant invitations to complement your wedding style? 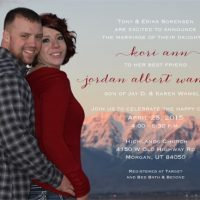 Let our talented designers at The Invitation Maker help you get the perfect elegant wedding announcements delivered to your door in as little as two weeks. Find a beautiful classic or unique contemporary look to match your wedding theme. Your dedicated designer is standing by to create custom invitations that are sure to wow your guests. Step 1: Browse our large collections of past examples to get inspiration. Step 2: Work one on one with a designer to refine your invitation look. Step 3: Focus on the other details of your wedding while we prepare and ship your announcements right to your door. 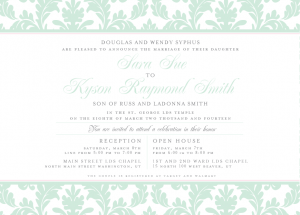 Don’t waste another minute trying to find gorgeous invitations! We have everything you need to get the elegant style you want at The Invitation Maker. For the day after the big day, we offer custom thank you cards that match your invitation style. We have the total package with personalized assistance, customizable designs, fast delivery and stunning invitations. 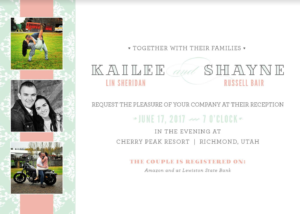 Our invitations, envelopes, inserts and thank you cards are printed in Utah and can be shipped anywhere in the USA or Canada. 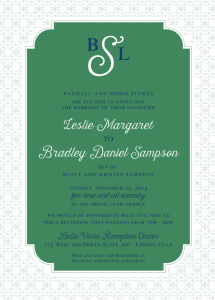 Specify your delivery type to have invitations in your hands as quickly as you need them. If you would like to receive a sample of our paper and print quality in the mail, please contact us to have one sent to your home. Get started today and have your custom elegant announcements delivered to your mailbox asap. 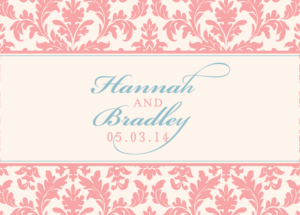 Focus on your other wedding day details knowing that your beautiful invitations are on the way. Begin by looking at our examples to get inspiration, view our FAQ to get more info, or contact us now to get answers to any questions you may have.